Do Face Masks Protect From Flu? It depends. If you're healthy, an N95 respirator may prevent you from breathing in particles that contain a virus. And if you're sick, a face mask may help prevent you from spreading the infection to others. But if you're not wearing them correctly, that protection is thwarted. Do Face Masks Protect From Flu? 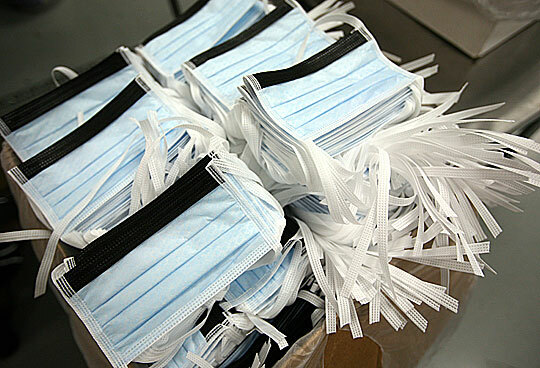 Disposable surgical masks are packed in boxes at Prestige Ameritech this week in Richland Hills, Texas. The Texas-based company is now working 24 hours a day, seven days a week to meet increased demand. All Things Considered staffer Gabe O'Connor's assignment for the day was to wear the mask and see if he could get any work done. So far, no studies have proven that face masks or respirators can prevent influenza transmission. However, both can provide some protection. Sick people can limit the spread of germs by wearing face masks. And respirators can prevent inhalation of airborne flu particles when worn properly. — Face masks are loosefitting, disposable masks that cover the nose and mouth. They are designed to prevent the wearer from spreading potentially contaminated airborne particles to people. 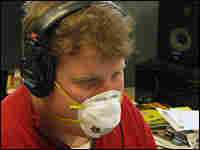 Face masks are not designed to protect the wearer from breathing in airborne particles, like the flu. — Respirators are designed to protect the wearer from breathing in very small particles, which might contain viruses. They fit tightly to the face so that most of the air is inhaled through the filter material. — If worn properly, the N95 respirator is designed to keep out airborne particles far smaller than the flu. It's been tested and shown to have 95 percent efficiency at blocking particles 0.3 microns and greater in size, says Kristin Cummings, of the National Institute for Occupational Safety and Health (NIOSH). Flu particles are transmitted primarily by virus-laden large droplets — particles ranging from 2 to 10 microns in diameter, according to the CDC. — Wearing a respirator does help protect you from breathing in contaminated air, but it's not a guarantee. You can also get the flu by touching contaminated surfaces, and then touching your hands to your mouth and nose. Handwashing with soap and water — for at least 20 seconds — is still very important. — A recent study by NIOSH and the CDC of respirator use to protect against mold in New Orleans found that only 24 percent of 538 people surveyed correctly put on the respirators. Here, CDC instructions on how to put on a respirator. — Like face masks, N95 respirators should be worn only once and then thrown away in the trash. Where do I find a respirator? Masks are not a foolproof way to prevent the spread of flu bugs. And the Centers for Disease Control and Prevention says it has a lot to learn about the potential effectiveness of masks in controlling swine flu. But as a precaution, experts say, the masks make sense for certain groups: people who are sick; and health care workers who are most likely to come in close contact with infected people. 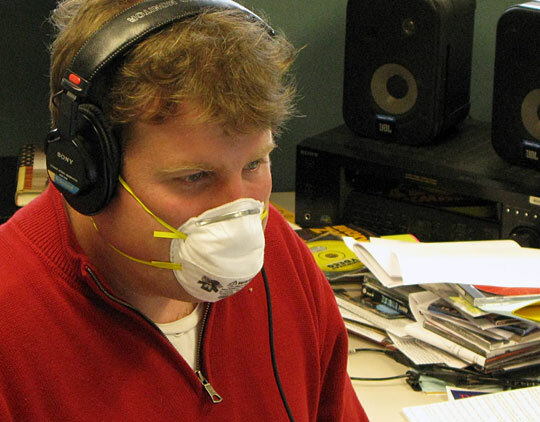 To get a sense of the hassle factor involved in wearing a mask, we asked NPR staffer Gabe O'Connor, a production assistant at All Things Considered, to wear one for the day. "This could be awkward," he said, as he donned an N95 respirator mask bought in the paint department of a local hardware store. There are a few tricks to wearing a respirator mask. "Putting a mask on properly is really important," says Urvashi Rangan, a technical expert with Consumer Reports. "You have to make sure the straps are on securely. " Following that advice isn't as easy as it sounds. One study found that only 25 percent of volunteers enrolled in a mask-wearing experiment were able to don the masks properly. "There were a couple of errors that were very common," says Kristin Cummings, of the National Institute for Occupational Safety and Health. "One was not tightening up the nose clip," she says. That's the metal strip at the top of the mask that should be adjusted to fit the contour of your nose. Another mistake: 22 percent of people put the mask on upside down. "It's incredibly hard for people to keep these on," said Consumer Reports' Urvashi Rangan. She says in one recent study researchers demonstrated that only about 20 percent of people are able to keep a mask on for the full amount of time specified. "That's not a lot of people." "It's really, really hot," said O'Connor, after wearing the mask for a few hours. He said it felt like he was in a jungle, breathing in hot, humid air. It also hampered communication. "I have to repeat myself," he said. And he didn't want to talk to his editor about the story he was writing because he thought he sounded like the garbled voices of the grown-ups in the Peanuts comic strip. O'Connor says that when you're wearing a mask, people will keep their distance from you. He says he realized that when a few colleagues politely declined to join him for coffee this morning. If the threat of contracting H1N1 were higher — if there were a critical mass of people ill — O'Connor says he could see how masks would be effective in the effort to enforce social distancing. "No one comes within 6 feet," he says. 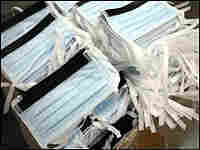 The CDC says it does not know if masks can prevent the spread of this new H1N1 virus. "It is difficult to assess their potential effectiveness," according to an interim recommendation. Experts say it can't hurt to wear one. If nothing else, it keeps you from touching your mouth and nose. "These are two great areas where this virus — or any virus — can gain access to your body," says Dr. Gwen Huitt, an infectious disease expert with National Jewish Health in Denver. Experts say masks are no replacement for good hygiene. As people have heard a lot recently, Huitt says, we all need to remember to wash hands frequently, and, of course, cover your cough.